December 9, 2016 – The propulsion system that will give the Orion spacecraft the in-space push needed to travel thousands of miles beyond the moon and back has completed major assembly at United Launch Alliance (ULA) in Decatur, Alabama. 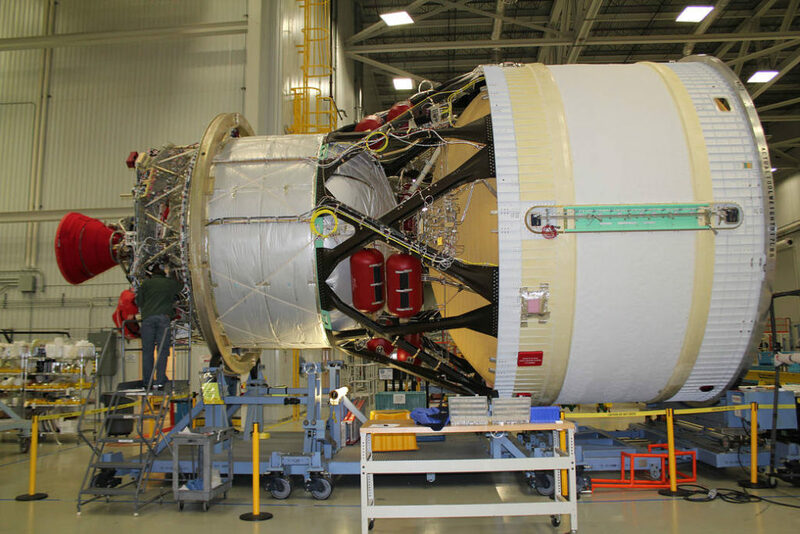 For the ICPS, Boeing modified the design of the existing ULA Delta Cryogenic Second Stage, used on United Launch Alliance’s Delta IV family of launch vehicles. The ICPS will be powered by an Aerojet Rocketdyne RL-10B engine – also currently used on the Delta Cryogenic Second Stage. Modifications to the Delta Cryogenic Second Stage include lengthening the liquid hydrogen tank, adding hydrazine bottles for attitude control and making some minor avionics changes to meet the design parameters and performance characteristics as needed by NASA to meet the flight objectives. With major assembly now complete on the flight hardware, the ICPS will undergo avionics installation at the ULA-Decatur factory; barge and road transport to the Delta Operating Center at Cape Canaveral, Florida, for avionics and system-level testing; and delivery to NASA in mid-2017. The initial SLS configuration will have a minimum 70-metric-ton (77-ton) lift capability and be powered by twin solid rocket boosters and four RS-25 engines. The next planned upgrade of SLS will use a more powerful exploration upper stage for more ambitious missions with a 105-metric-ton (115-ton) lift capacity. Lockheed Martin of Littleton, Colorado, is the prime contractor for the Orion spacecraft.